Substantial majorities of Americans are serving the needs of their communities and their own families at least pretty well. Some 37% say their local libraries serve the needs of their communities “very well” and another 39% say “pretty well.” At the same time, 34% say their local libraries serve them and their families “very well” and 36% say “pretty well.” While the share is small for those who fell negatively about how libraries are performing in their local education scene, it is worth noting that 12% said they “don’t know” when the question involves libraries and community education systems and 7% said “don’t know” when the issue is about how libraries are serving their own needs and those of their families. Library users: Those who have visited a library or bookmobile in the past 12 months and those who have used library websites are more positive about the way libraries fit into community educational ecosystems and the way they serve respondents and their families. Some 45% of recent library visitors say their local library meets their communities’ education needs “very well,” compared with 31% of those who were not recent library visitors who feel that way. Similarly, 45% of recent library users say libraries serve the educational needs of them and their families “very well,” compared with 26% of those who have not visited a library in the past year. Lifelong learners: Those who say that the term “lifelong learner” applies “very well” to them are also more likely than others to say libraries are doing well in serving their community and personal needs. Some 39% of lifelong learners say libraries are doing “very well” in serving their communities’ learning and educational needs, compared with 32% of those who do not define themselves as lifelong learners. In addition, 37% of lifelong learners say libraries serve the educational activities of them and their families “very well,” compared with 27% of others who say that. Personal learners and professional learners: Interestingly, there are not major differences between personal learners and others and professional learners and others in their responses to both questions about libraries and their communities and libraries and their families. 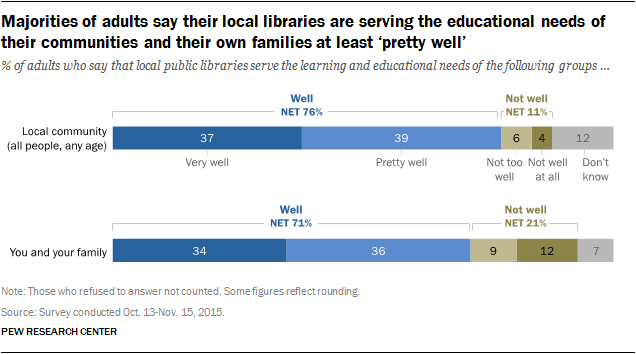 Personal learners are a bit more likely than others to say libraries do “pretty well” at serving their communities’ educational needs (42% vs. 33%) and “pretty well” at serving the educational needs of them and their families (38% vs. 31%). However, there are not differences either among professional learners and others as well as personal learners and others when it comes to those who say libraries do “very well” at both tasks. Women: Women are more likely than men to be library users and women are also more likely to have the most positive views about the role of libraries in community and personal learning activities. Some 41% of women believe that their public libraries serve the learning and educational needs of their communities “very well,” compared with 34% of men who believe that. 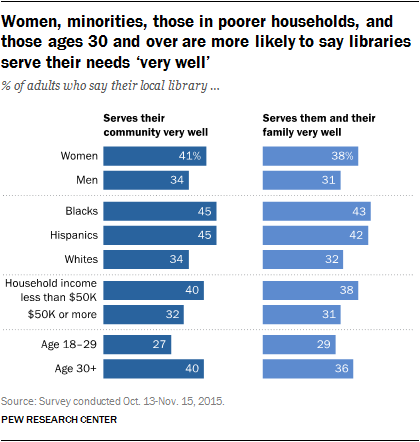 Similarly, 38% of women say their public libraries serve the educational needs of themselves and their families “very well,” compared with 31% of men. Lower income: Those living in households earning less than $50,000 are more likely than those in higher-income households to say that libraries serve community learning needs “very well”: 40% of those in lower-income households say that, compared with 32% of those in households earning $50,000 or more. Similarly, 38% of those in households earning less than $50,000 say libraries serve their and their families’ learning and educational needs “very well,” compared with 31% of those living in higher-income households. Those over age 30: Those ages 30 and older are somewhat more likely than young adults to have the most positive views about how libraries serve the learning interests of their patrons and communities: 27% of those ages 18 to 29 say libraries serve the educational needs of their communities “very well,” compared with 40% of those ages 30 and older. Similarly, 29% of young adults say they believe libraries have served the educational needs of themselves and their families “very well,” compared with 36% of those ages 30 and over who say that. E-book borrowing: Fully 90% of public libraries have e-book lending programs, according to Information Policy and Access Center (IPAC) at the University of Maryland, and 62% of adults say they know that their local libraries have such a program. At the same time, 22% say they do not know whether e-book lending is done by their libraries and another 16% say it is not done by their community libraries.Among those most likely to say they do not know if their local libraries lend e-books: men, rural residents and those without college degrees. Among those most likely to say their local libraries do not lend e-books: blacks, Hispanics, people living in households earning less than $30,000 and non-internet users. Online career and job-related resources: Some 62% of local libraries offer such resources, according to IPAC, and 41% of adults say in our survey they know their local libraries have such material. Still, 38% say they do not know if such resources are offered by their local libraries and another 21% say their libraries do not offer career- and job-related resources.Among those most likely to say they do not know if their local libraries have resources for jobs and careers: whites, those with less than college degrees and those living in households earning $50,000 or more. Among those most likely to say their local libraries do not have career-related resources: men, blacks, Hispanics, people living in households earning less than $30,000, and those whose education stopped with a high school diploma. Online GED or high school equivalency classes: Some 35% of local libraries offer GED prep courses and materials, according to IPAC, and 26% of adults say they know their local libraries offers such programs. Yet nearly half (47%) say they do not know if such programs are offered by their local libraries and another 27% say these kinds of classes are not available in their communities.Among those most likely to say they do not know if their local libraries provide GED classes: whites, those with at least some college experience and those in households earning $50,000 or more. Among those most likely to say their local libraries do not offer high school equivalency classes: blacks, Hispanics, adults under age 30, those with high school diplomas or less and suburban residents. Programs on starting a new business: Some 33% of local libraries offer such programs, according to IPAC, and 24% of adults say their local libraries offer such programs. About half (47%) say they do not know if their local libraries do that and another 28% say their public libraries do not offer programs for starting a new business.Among those most likely to say they do not know if their local libraries provide programs for starting a new business: whites, those with some college experience and those in households earning $50,000 or more. Among those most likely to say their local libraries do not offer programs for starting a new business: blacks, Hispanics, adults under age 30, those with high school diplomas or less and suburban residents. Online programs that certify that people have mastered new skills: Some 24% of adults say their local libraries offer such programs. However, about half of adults (49%) say they do not know if such programs are being offered and another 27% say they are not offered by their local libraries. There are no data about how many libraries offer such programs.Among those most likely to say they do not know if their local libraries provide programs that certify that people have mastered new skills: women, whites, those ages 30 and older, those with college experience and those in higher-income households. Among those most likely to say their local libraries do not offer certification programs: men, blacks, Hispanics, adults under age 30, and those with high school diplomas or less.